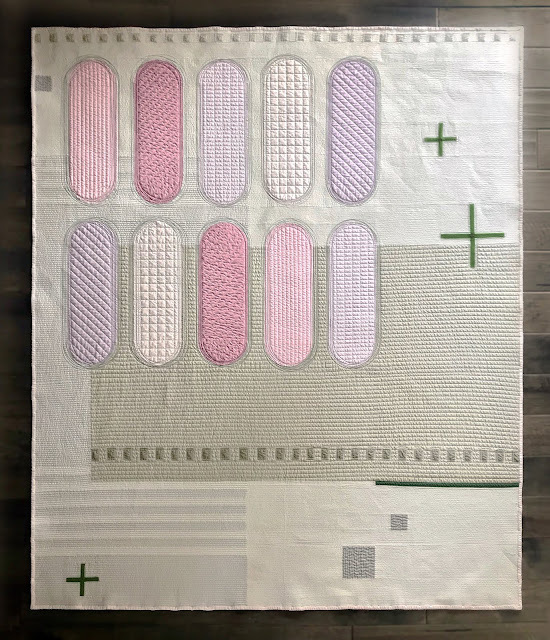 At the end of 2017 I completed a quilt for submission to Curated Quilts Issue 3: Minimalism. Quilts that are minimalist will have large areas of negative space and rely on balance and color, or lack of, to carry the design. There are so many amazing modern quilts that can be categorized as modern minimalism. If you would like to see more examples of modern minimalism I recommend checking out the new MQG book. I was instantly drawn to the colors and proportions of each color. The pom pom also reminded me of the rabbit feet key chains I used to see at the county fair and came up with the name Faux Hare Fair. Thankfully I haven't seen too many rabbit feet for sale in the last 25 years. This past fall Curated Quilts, a quarterly magazine, posted submission guidelines for their second issue with a log cabin theme. 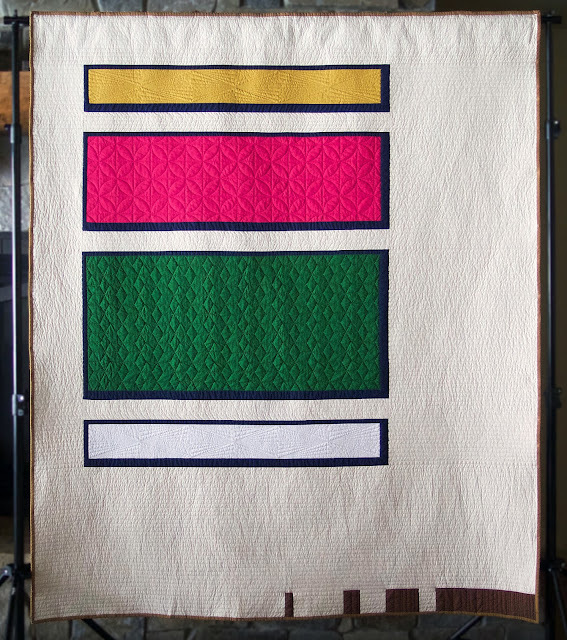 I don't typically work with log cabin blocks but since I had such a great time designing an entry for the Curated Quilt mini challenge I thought I'd challenge myself to design a modern log cabin baby quilt, 40" x 50". I knew right off I wanted to mix an organic black and white stripe with the crispness of solids. I'm still in love with yellow so I chose a retro color palette. 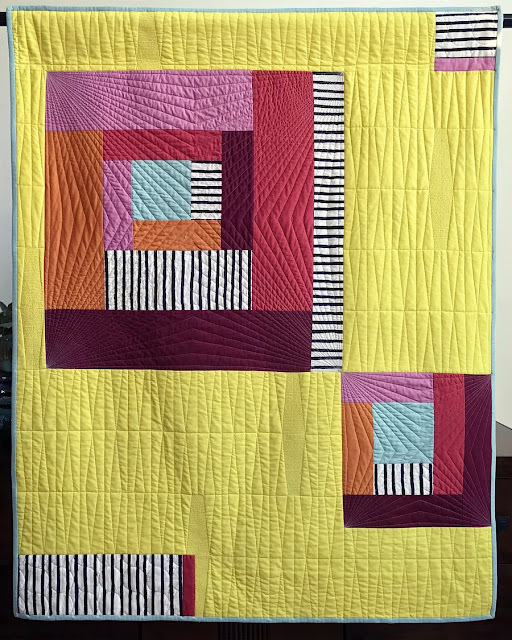 When I started planing out a quilting design I wanted to keep it very "mod" and at the same time I didn't want it to distract from the structure of the log cabin blocks. In the end I quilted a tumbler-esq shape for the background singling out a few areas to fill in with quilting completely and a point to point pattern for the log cabins. Let's start the year off with some exciting news! 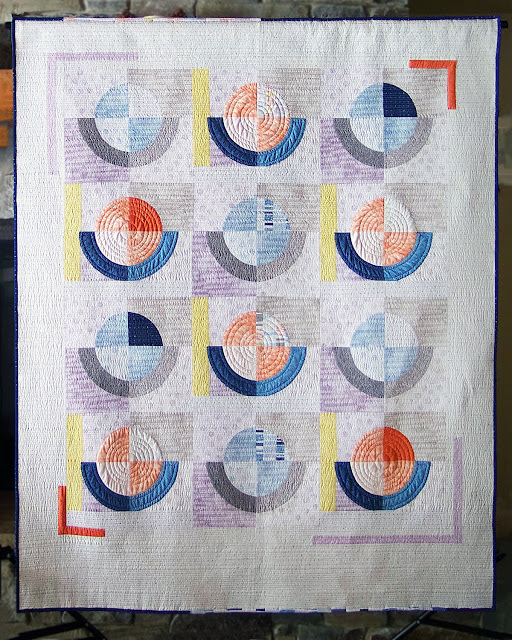 Here is my Moments quilt designed for Robert Kaufman's new fabric line from Emmie K, Lou Lou. 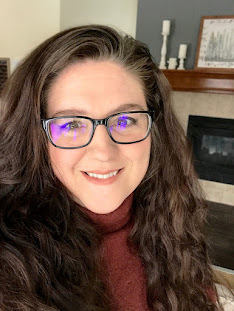 Following Quilt Market I was contacted by a Robert Kaufman representative and asked if I would be interested in designing a quilt for a new fabric line. I couldn't believe it. I even had a friend read the email just to make sure I'd read it right. It turns out that Emmie K is a fan of my Clambake quilt and thought that design would work well with her new line which is so cool because I'd been a fan of her Geo Pop canvas I & II. I just love the prints in the line. The colors are so great and I love the how versatile all the prints are. I'm especially loving those multi-colored pluses on off white, don't be surprised to see those popping up in my designs this year.